A power filter is probably the most important part of an aquarium. Between fish and plants aquariums are messy. Uneaten food, fish waste, detritus from plants, and even dirt and dust from outside of the tank can build up inside. A messy tank can incubate the growth of bacteria and algae. All of this can create a harmful and deadly environment for fish. In order to foster a clean and healthy habitat tank water needs to be cleaned on a very regular basis. An aquarium power filter does just that. Tank water is pulled in through an intake and pushed through filter medium. This is where aquarium filters differ. Some filters may feature one-stage of filtration, while some filters on the market feature as many as five filtration stages. A variety of filter mediums, such as sponges or carbon, can be used to clean the water. Different mediums remove different materials. Mechanical filtration remove solids, such as food and fish waste. Chemical filtration removes odors. Biological filtration uses bacteria to convert ammonia, which enters the tank through fish waste and is very harmful, into much safer nitrates. Some hang on back filter models accept generic filter mediums, while others only accept proprietary filter cartridges. After the water is processed through the fish tank filter it is returned to the tank. If the filter features a cascade or waterfall return the water will be aerated as it falls into the tank. Oxygenating the tank water is necessary to force carbon dioxide out of tank, and create a safe and healthy environment for fish. Ideally, the intake and return on a filter should be as far apart as possible. If clean water from the return enters the tank near the intake it is possible clean water will continually be passed through the filter, leaving dirty water in the rest of the tank. When selecting the best power filter for your aquarium be aware of the filtration needs of your setup. 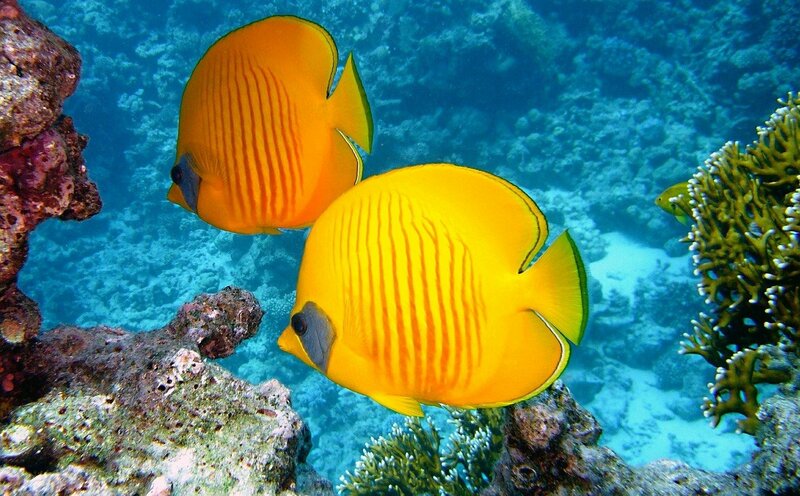 Different species of fish produce different amounts of waste. Messier fish are better suited with more powerful models that feature several levels of filtration. Also look at the flow rate on the return. A forceful flow rate will create a current and aerate the water, which is ideal for some species of fish, but can pose a problem for others. Some models feature an adjustable flow rate, that can be customized to fit the specific needs of an aquarium, or can be moved to an altogether different aquarium if necessary. 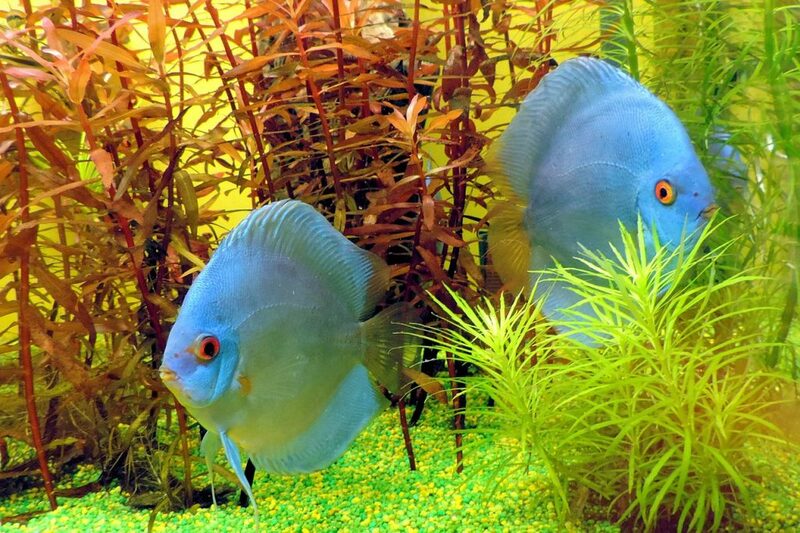 It is important to select a filter that meets the needs of the fish and plants in the tank. 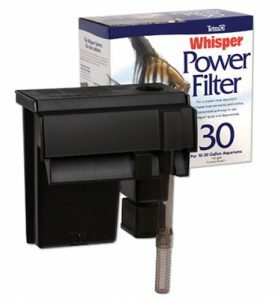 An aquarium power filter also needs to be matched to the size of the fish tank. The amount of water that can pass through a filter is measured as Gallons Per Hour (GPH). Large tanks, and even small tanks with messy fish or plants, need an aquarium filter with a high GPH. 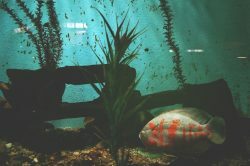 The type of fish and plants in the tank and the size of the tank determine how often the water in an aquarium needs to be turned over, and this determines the ideal GPH. This fish tank filter comes with AquaClear Foam, Activated Carbon and BioMax and Cycle Guard, which utilizes biological filtration for improved water quality. Biological filtration is a process that utilizes bacteria to convert harmful ammonia, which is a byproduct of fish waste, into somewhat less dangerous nitrites, which is then converted into safer nitrates. Flow control makes it possible to adjust the rate at which water leaves the filter, giving control over the creation of currents. The waterfall return aerates the water, creating a more hospitable habitat. The energy efficient design reduces operational costs while still thoroughly and effectively cleaning water. 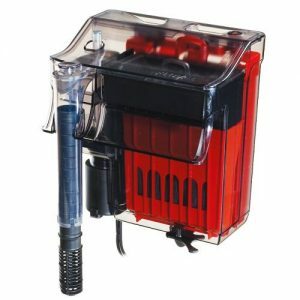 The base model is the AquaClear Powerhead 10. It measures 4.5″ x 2″ x 4″, and is best suited for 10 gallon aquariums. It can process 80 GPH. The AquaClear 20 Power Filter is 4.5″ x 7″ x 6.5″, it is intended for 5 – 20 gallon tanks, and can process 100 GPH. The AquaClear 30 Power Filter measures 4.5″ x 8.2″ x 6.7″. This filter is designed to work in 10 – 30 gallon tanks, and can process 150 GPH. The AquaClear 50 Power Filter measures 4″ x 9″ x 8″, and is best for 20 – 50 gallon tanks. It is able to handle 200 GPH. The AquaClear 70 model is 6.2″ x 10.7″ x 8.6″. It is designed to work in 40 – 70 gallon tanks, while being able to process 300 GPH. 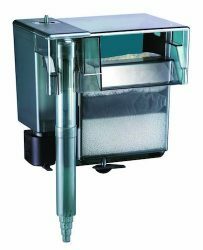 The top model in the series is the AquaClear 110 aquarium power filter, which measures 7.1″ x 13.9″ x 9.1″, and is intended for 60 – 110 gallon tanks, while being able to handle 500 GPH. The AquaClear Power Filter can be noisy to operate. The waterfall return does help to cover the operational noise of the pump, but in some instances the filter noise overpowers the sound of the waterfall. This filter is not ideal for use in small tanks with sand bottoms, because the powerful intake can pull the sand into the filter, which can clog the filter medium. It is better suited to gravel bottoms. 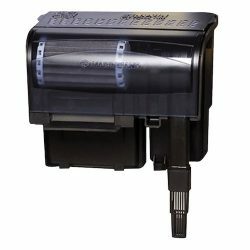 When a hang on the tank filter has a clogged cartridge it is possible for the tank to overflow, but not the Aqueon QuietFlow aquarium power filter 10. This filter features an LED light that flashes when the cartridge needs to be changed, making it easy to know exactly when to perform maintenance to maintain a healthy fish habitat and prevent a mess outside of the tank. The 4-stage process includes mechanical, carbon, and biological filtration, along with a diffuser grid to remove additional toxins while also oxygenating the water. The submersed pump design does not require priming when the filter is first set up or started after maintenance. 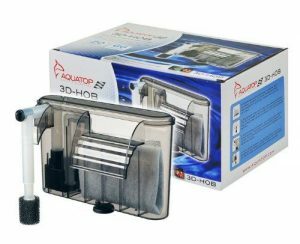 There are five entries in the QuietFlow series of hang on the tank aquarium filters. The QuietFlow 10 measures 6.5″ x 4.5″ x 6.2″, and can handle up to 20 gallons at 100 GPH, while the QuietFlow 20 is 7.6″ x 4.8″ x 8″, and can handle up to 30 gallons at 125 GPH. The QuietFlow 30 measures 8.4″ x 4.6″ x 7.9″, and is designed to process 200 GPH and can handle up to 45 gallons. The next model is the QuietFlow 50, which measures 8.4″ x 4.1″ x 7.9″, and can accommodate up to 50 gallons at 250 GPH. The final model in the series is the QuietFlow 55/75. It measures 12.9″ x 6.6″ x 8.4″, can handle up to 90 gallons, and can process 400 GPH. This filter can be very loud when running, and is disruptive. While a 4-stage filtration process offers superior results, the filter medium and cartridges are expensive to replace. This makes it an expensive filter to run, and can be cost prohibitive. The Penguin 100B can handle 100 GPH, and is best for tanks up to 20 gallons. The base entry filer is compatible with Rite Size media A. The next installment is the Penguin 150B, which is able to process 150 GPH, and is suited for tanks up to 30 gallons. This filter accepts Rite Size media B. The Penguin 200B is designed to handle 200 GPH, and tanks up to 50 gallons. While the Penguin 350B can process 350 GPH, and is ideal for tanks up to 70 gallons. The 200B and 350B models both accept Rite Size media C. The Emperor 400 Pro Series filter can accommodate 400 GPH, while working best in tanks up to 80 gallons. This filter is compatible with Rite Size media E. The 400 Pro Series features a 2-pump design for powerful operation. All of the filters in this series utilize 3-stage filtration, including mechanical, chemical, and biological. There is 100 percent water to media contact to ensure tank water is safe and clear. The 2-piece vented cover allows for easy access to the cartridge for simple maintenance. The adjustable water flow of the Penguin power filter is not very significant. When the mid-level strainer is adjusted there is very little change in the water flow. The BIO-Wheel filter and the motor both make noise while operating. Depending on the placement of your aquarium this may not be major, but if placed in a quiet area if can be noticeable. Powerful 5-stage filtration makes the Fluval power filter a welcome addition to any aquarium. Two mechanical filtration levels, featuring foam and polyester remove debris. An integrated trickle chamber features a Bio-Screen and C-Nodes to facilitate two biological filtration stages quickly and efficiently. Lastly, the chemical activated carbon insert basket maximizes toxin removal for a clean and safe environment. The cleaning indicator alerts when the polyfoam filter needs to be rinsed to ensure the tank conditions are optimal and maintenance happens when needed. The hang on the tank design allows for easy access to replace the filter medium. There are three models in the Fluval power filter series. The C2 measures 4.5″ x 6″ x 8″, and can process a maximum flow rate of 119 GPH. This filter is best for smaller tanks of approximately 10 – 30 gallons. The C3 measures 4.5″ x 7″ x 8″, and is intended for 20 – 50 gallon tanks. It is able to accommodate 153 GPH. The final filter in the series is the C4, which measures 6″ x 8.2″ x 8.5″. It works best in 40 – 70 gallon tanks, and can process 265 GPH. This filter uses proprietary inserts and media. Replacements can be expensive, making it costly to operate this fish tank filter. Limited flow control means this filter is not suitable for use in aquariums containing species of fish that are sensitive to current. The Tetra Whisper power filter features four models in the series. The base model is intended for up to 20 gallon tanks. The remaining filters are intended for up to 30, 40, and 60 gallon tanks. 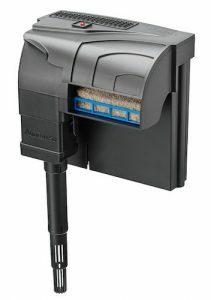 The adjustable flow feature allows this versatile filter to be used in a variety of aquariums. Whether your tank needs a subtle current and slight aeration of the water, or a more brisk current, this filter is up to the task. Bio-Bag cartridges feature a 3-stage filtration to keep water safe and clear. The Ultra-activated carbon filtration removes odors and discoloration. The dual-sided dense mesh filter removes uneaten food, fish waste, and other debris. Lastly, the BioFoam filtration cultivates aerobic bacteria to convert ammonia into nitrates. Replacement filters are sold pre-assembled, which can easily be installed. There is also the option to purchase unassembled multipack replacement cartridges for a cost-effective filter media solution. The intake tube can be a loose fit, which will allow air to be pulled into the filter if the water level is low. This can cause noisy operation. The connection point between the intake tube and the filter housing can be modified for a more tight and secure fit. This filter can be loud, and it may rattle when in use, which can be a disturbance. The Marina power filter features a hang on the back design, but the housing is slim, allowing this filter to fight in tight spaces. There are three filters in the Slim series, they support tanks up to 10, 15, or 20 gallons, respectively. The filter medium is easy to access, so cartridges can quickly be replaced without any difficulty or mess. Bio-Guard filtration utilizes one included Bio-Carb cartridge, and one included Bio-Clear cartridge to effectively clean water for a safe environment. Both cartridges contain Ceramitek, which aids in biological filtration, to quickly convert dangerous ammonia into nitrates. The adjustable height enables this filter to function in different water levels, allowing for use in turtle tanks or other setups. The flow control is adjustable, meaning this filter can be used in aquariums containing a variety of fish species. The self-priming design makes set up easy, and even lets this filter get back to work quickly after routine maintenance. Ultra quiet operation minimizes noise and disruption. One feature that sets this filter apart is a sponge located over the water intake that prevents small fish and fry from being pulled into the filter. This is a great feature in terms of protecting small fish, but it limits the ability of the filter to remove debris, such as uneaten food and fish waste. The filters have a short lifespan, and need to be replaced often. The filters are not particularly expensive, but because they need to be replaced frequently, this cost adds up. Hang on the back fish tank filters are easy to access, which can make routine maintenance and accessing the filter medium to wash or replace quick and simple. Hang on back filters are also visible. It is possible to creatively place plants and aquascaping to hide the part of the filter that is in the tank, but part of the filter housing will be above the tank and visible. If attempting to conceal the submerged portion it is key to not impede the function of the filter. For instance, place plants far enough away from the intake so they are not pulled into the filter. This can harm live plants, destroy fake plants, and possibly damage the filter. 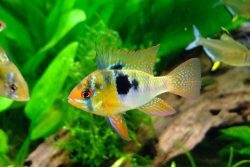 When selecting the best fish tank filter and best aquarium filter for your setup, consider the species and quantity of fish, and live plants, if applicable, in your aquarium. Also consider the size of your fish tank. If you have a freshwater or saltwater, also known as marine, aquarium make sure the filter you select works with that setup. Most aquarium filters are compatible with both fresh- and saltwater, but double-check to ensure proper operation and safety of fish. Replacement filter medium will be an ongoing expense. While it is absolutely necessary to choose a filter that thoroughly cleans the tank water, you should also choose a filter that utilizes an affordable filter medium.